E – TRIPLETT(17); McCANN(12); SLEVIN(5); HUBKA(5); DAVIDIUK(12). DP – Clemson 1; Furman 1. LOB – Clemson 7; Furman 8. 2B – PYZIK(4); CAUDILL 3(9); FRANKEY(12); HUBKA(7). HR – FRANK(7). HBP – HILL 2; BETSILL. SF – HILL(3). SB – EVANS(6). CS – SLEVIN(3). Clemson 1st – GREEN lined out to cf. TRIPLETT grounded out to 3b. JOHNSON grounded out to 1b unassisted. 0 runs, 0 hits, 0 errors, 0 LOB. Furman 1st – HILL grounded out to 1b unassisted. CAUDILL doubled to left field. NORMAN grounded out to 2b; CAUDILL advanced to third. FRANKEY singled to center field, RBI; CAUDILL scored. McLAIN struck out swinging. 1 run, 2 hits, 0 errors, 1 LOB. Clemson 2nd – McCANN singled up the middle. FRANK flied out to rf. SLEVIN grounded into double play 3b to 2b to 1b; McCANN out on the play. 0 runs, 1 hit, 0 errors, 0 LOB. Furman 2nd – BETSILL singled up the middle. HUBKA doubled to left center; BETSILL advanced to third. GREENE reached on a fielder’s choice to pitcher, bunt; HUBKA advanced to third; BETSILL out at home p to c. DAVIDIUK walked; GREENE advanced to second. HILL flied out to rf, SF, RBI; DAVIDIUK advanced to second; GREENE advanced to third; HUBKA scored. CAUDILL grounded out to 2b. 1 run, 2 hits, 0 errors, 2 LOB. Clemson 3rd – HOURIGAN singled to right field. DEMMINK walked; HOURIGAN advanced to second. PYZIK reached on a fielder’s choice to pitcher, bunt; DEMMINK advanced to second; HOURIGAN out at third p to 3b. GREEN grounded out to 1b unassisted; PYZIK advanced to second; DEMMINK advanced to third. TRIPLETT grounded out to 3b. 0 runs, 1 hit, 0 errors, 2 LOB. Furman 3rd – NORMAN grounded out to ss. FRANKEY grounded out to 1b unassisted. McLAIN singled to right field. BETSILL struck out looking. 0 runs, 1 hit, 0 errors, 1 LOB. Clemson 4th – JOHNSON struck out swinging. McCANN flied out to lf. FRANK singled through the right side. SLEVIN reached on a throwing error by ss; FRANK advanced to second. HOURIGAN singled up the middle, RBI; SLEVIN advanced to second; FRANK scored, unearned. DEMMINK walked; HOURIGAN advanced to second; SLEVIN advanced to third. PYZIK reached on a fielder’s choice to third base; DEMMINK advanced to second; HOURIGAN out at third 3b unassisted. 1 run, 2 hits, 1 error, 3 LOB. Furman 4th – HUBKA struck out looking. GREENE grounded out to 2b. DAVIDIUK grounded out to ss. 0 runs, 0 hits, 0 errors, 0 LOB. Clemson 5th – GRIFFIN to p for HURST. GREEN singled to first base, bunt. TRIPLETT singled to right field; GREEN advanced to second. JOHNSON flied out to rf to right center. McCANN walked; TRIPLETT advanced to second; GREEN advanced to third. FRANK homered to left field, 4 RBI; McCANN scored; TRIPLETT scored; GREEN scored. SLEVIN flied out to rf down the rf line. HOURIGAN grounded out to ss. 4 runs, 3 hits, 0 errors, 0 LOB. Furman 5th – HILL hit by pitch. CAUDILL doubled down the lf line; HILL advanced to third. NORMAN popped up to 1b. FRANKEY singled to left center, 2 RBI, advanced to second on the throw; CAUDILL scored; HILL scored. McLAIN grounded out to 1b unassisted; FRANKEY advanced to third. BETSILL flied out to rf to right center. 2 runs, 2 hits, 0 errors, 1 LOB. Clemson 6th – EVANS pinch hit for DEMMINK. EVANS grounded out to 3b. PYZIK doubled to right center. GREEN grounded out to 1b unassisted; PYZIK advanced to third. TRIPLETT singled to third base, bunt, RBI; PYZIK scored. JOHNSON singled to right field, advanced to third; TRIPLETT advanced to third, scored on a fielding error by rf. WASHMUTH to p for GRIFFIN. McCANN singled to left field, RBI; JOHNSON scored, unearned. FRANK grounded out to p, bunt. 3 runs, 4 hits, 1 error, 1 LOB. Furman 6th – EVANS to dh. HUBKA popped up to 1b. GREENE singled up the middle. DAVIDIUK singled to pitcher; GREENE advanced to second. HILL lined into double play 3b to 2b; GREENE out on the play. 0 runs, 2 hits, 0 errors, 1 LOB. Clemson 7th – SLEVIN singled through the left side. SLEVIN out at second c to 2b, caught stealing. HOURIGAN struck out swinging. EVANS singled down the rf line. EVANS stole second. PYZIK grounded out to 1b unassisted. 0 runs, 2 hits, 0 errors, 1 LOB. Furman 7th – ROHRBAUGH to p for CRIBB. CAUDILL struck out swinging. NORMAN popped up to 2b to center field. FRANKEY popped up to 1b. 0 runs, 0 hits, 0 errors, 0 LOB. Clemson 8th – HODINKA to p for WASHMUTH. GREEN flied out to rf. TRIPLETT lined out to 3b. JOHNSON grounded out to 2b. 0 runs, 0 hits, 0 errors, 0 LOB. Furman 8th – HUB to rf for GREEN. LATORA pinch hit for McLAIN. LATORA singled through the right side. BETSILL hit by pitch; LATORA advanced to second. HUBKA flied out to cf; LATORA advanced to third. HAHN to p for ROHRBAUGH. GREENE reached on a fielder’s choice to shortstop, RBI, advanced to second; BETSILL advanced to second on a fielding error by ss, advanced to third; LATORA scored. DAVIDIUK struck out swinging. HILL hit by pitch. CAUDILL doubled to right center, 3 RBI, advanced to third on a throwing error by 2b; HILL scored, unearned; GREENE scored, unearned; BETSILL scored, unearned. TROLIA to p for HAHN. NORMAN singled to left field, RBI; CAUDILL scored, unearned. FRANKEY doubled to right field, RBI; NORMAN scored, team unearned. LATORA reached on a throwing error by 3b; FRANKEY advanced to third. BETSILL fouled out to lf down the lf line. 6 runs, 4 hits, 3 errors, 2 LOB. 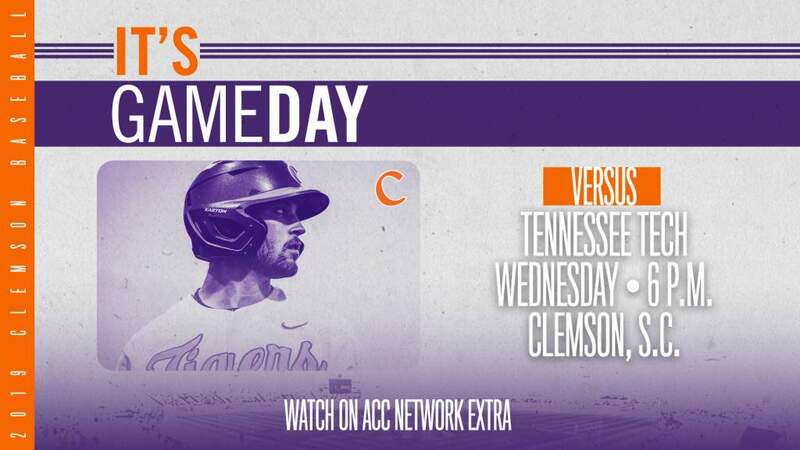 Clemson 9th – LATORA to dh. MITCHELL to p for HODINKA. McCANN flied out to cf. FRANK grounded out to ss. SLEVIN flied out to cf to left center. 0 runs, 0 hits, 0 errors, 0 LOB.